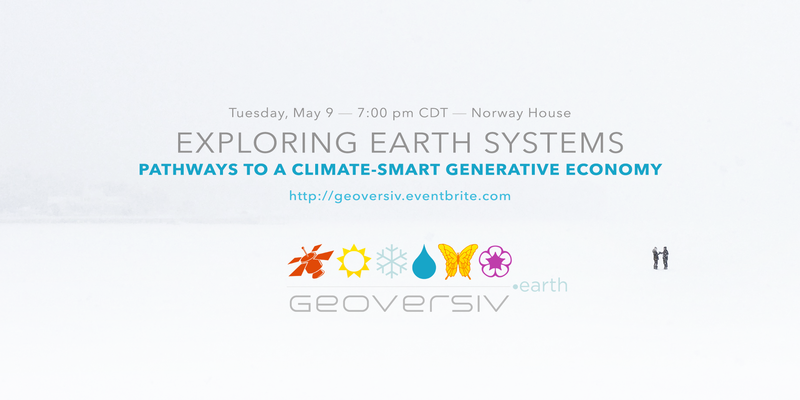 On Tuesday, May 9, the Norway House hosted a moderated discussion titled Exploring Earth Systems: the Geoversiv Approach to Smart Future-Building, with Don Shelby and Joseph Robertson. The event was held in the Norway House Galleri, where explorer David Thoreson‘s brilliant, moving photography exhibit ‘Over the Horizon’ was on display. Exploring Earth Systems opened at 7:00 pm CDT, with an informal reception. At 7:30, Christina Carleton—Executive Director of Norway House—welcomed the audience and introduced the evening’s moderator, Don Shelby. At 7:35, Don Shelby—prize-winning journalist and recognized pioneer in the communication of climate change science and the need for climate-smart policy—introduced the evening’s guest speaker. At 7:45, Joseph Robertson—founder and president of the Geoversiv Foundation—presented the Geoversiv approach to building a climate-smart economy. After the Geoversiv presentation, Don Shelby moderated a discussion between Joseph Robertson and the audience. The global unsustainability crisis extends not only to food and water supplies, the endangerment of species and habitats, and life-sustaining ecosystems, but also to the future viability of the stable climate system and of nation states. The choice between unsustainable practices and a sustainable future is a choice about the security of human civilization, and the liberating values we have come to cherish. The Geoversiv approach to smart future-building focuses on generative strategies that build value and capability at the human scale. Embracing complexity as the most direct path to clarity, we look for critical trends that add, hide, limit or expand value not priced in the everyday economy. We then develop tools to empower people, communities, and decision-makers to better secure those non-price drivers of future value. These innovations will help us to solve problems faster and build an economy that works for everyone. Joseph Robertson is Global Strategy Director for the non-partisan non-profit Citizens’ Climate Lobby. He coordinates the building of CCL’s citizen engagement groups on 5 continents and represents CCL in the Carbon Pricing Leadership Coalition, UNFCCC negotiations, and other UN processes. He is a member of the Executive Board of the NGO Committee on Sustainable Development-NY. Joseph is Founder and President of the Geoversiv Foundation and the lead strategist supporting the high-level climate dialogue series Accelerating Progress, Advancing Innovation.